Herbert Clark Hoover (August 10, 1874 – October 20, 1964) was an American politician who served as the 31st President of the United States from 1929 to 1933. A Republican, as Secretary of Commerce in the 1920s he introduced Progressive Era themes of efficiency in the business community and provided government support for standardization, efficiency and international trade. As president from 1929 to 1933, his ambitious programs were overwhelmed by the Great Depression, that seemed to get worse every year despite the increasingly large-scale interventions he made in the economy. He was defeated in a landslide in 1932 by Democrat Franklin D. Roosevelt, and spent the rest of his life as a conservative denouncing big government, liberalism and federal intervention in economic affairs, as Democrats repeatedly used his Depression record to attack conservatism and justify more regulation of the economy. He was a professional mining engineer and was raised as a Quaker. Hoover served as head of the U.S. Food Administration during World War I, and became internationally known for humanitarian relief efforts in wartime Belgium. As the United States Secretary of Commerce in the 1920s he promoted partnerships between government and business. In the presidential election of 1928, Hoover easily won the Republican nomination, despite having no elected-office experience. 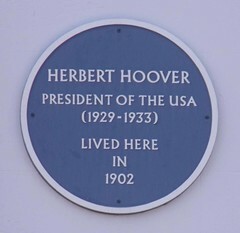 Hoover is the most recent cabinet secretary to be elected President of the United States, as well as one of only two Presidents (along with William Howard Taft) who had neither been elected to a national political office or governorship, nor served as military generals. Although Hoover never raised the religious issue, some of his supporters did in mobilizing anti-Catholic sentiment against his opponent Al Smith. Hoover, a globally experienced engineer, believed strongly in the Efficiency Movement, which held that the government and the economy were riddled with inefficiency and waste, and could be improved by experts who could identify the problems and solve them. He also believed in the importance of volunteerism and of the role of individuals in society and the economy. A rich man, Hoover donated all his federal paychecks to charity). When the Wall Street Crash of 1929 struck less than eight months after he took office, Hoover tried to combat the ensuing Great Depression in the United States with large-scale government public works projects such as the Hoover Dam, and calls on industry to keep wages high. He reluctantly approved the Smoot–Hawley Tariff, which sent foreign trade spiralling down. He believed it was essential to balance the budget despite falling tax revenue, so he raised the tax rates. The economy kept falling and unemployment rates rose to about 25%. This downward spiral, plus his support for prohibition policies that had lost favor, set the stage for Hoover's overwhelming defeat in 1932 by Democrat Franklin D. Roosevelt, who promised a New Deal. After Roosevelt assumed the Presidency in 1933, Hoover became a conservative spokesman for opposition to the domestic and foreign policies of the New Deal. In 1947, President Harry S. Truman appointed Hoover to head the Hoover Commission, intended to foster greater efficiency throughout the federal bureaucracy. Most historians agree that Hoover's defeat in the 1932 election was caused primarily by the downward economic spiral, although his strong support for prohibition was also significant. Hoover is usually ranked lower than average among U.S. Presidents.